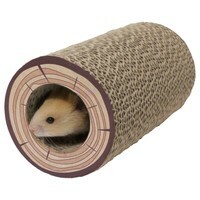 Boredom Breaker Shred-A-Log Corrugated Tunnel for Small Animals is a simple yet versatile toy, offering both physical and mental stimulation to a range of small animals. Hamsters, mice and gerbils can enjoy hours of fun chewing, playing and sleeping in their new tunnel. Rabbits, Guinea Pigs and other larger pets are able to toss and shred the pet-safe, corrugated tunnel, which can be made particularly enjoyable when filled with their favourite hay! This versatile toy is also ideal to slide over a perch or hang from a cord for parakeets and parrots. My Guinea pigs don't seem to be that interested with this product. I stuff it will hay and they eat the hay but they don't really seem to be very keen to chew it unfortunately.